Fast charge modes are only available for the Samsung Galaxy products: Note 5, Galaxy S6, Galaxy S6 Edge, Galaxy S7, S7 Edge, Galaxy S8, S8 plus, and other devices with QI standard will charge at a regular speed; Some devices may require an additional wireless charging receiver (not included). 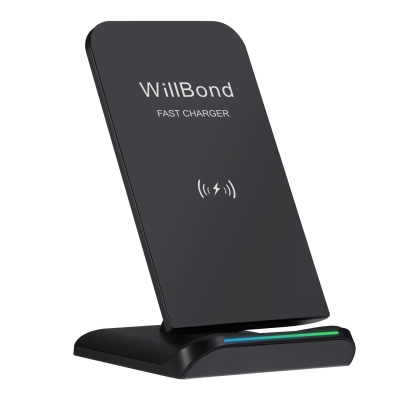 Say goodbye to tangled wires and lost charging cables; And the wireless charging stand allows you to charge your compatible phone device up to 1.4 times faster than standard wireless charging transmitters; Taking your wireless charging experience to the next level by applying the fast wireless charging stand; (Applying QC 2.0 and QC 3.0 fast charge technology AC adapter which are not included); The stand is also compatible with any QI-enabled device so you can charge those devices wirelessly at standard speeds. The charger features incline and non-slip bracket, which offers good view angle to watch movies, listen to music or play games while charging your phone wirelessly, and keep your phone stay safely; The multi-colored LED indicator will show the different charging status. 1. Please place your phone in the center of the wireless charger stand. 2. Phone case is strongly suggested to be removed while charging. The charger is certificated by FCC, RoHS and CE; It is built-in over-voltage, under voltage, and short-circuit protection, which provides ultimate safety for your smartphone; If the temperature exceeds 50 degree when charging the device, it will automatically reduce the charging current and keep the equipment safe.